Please also read amplitude ratio concept to keep track with this topic. 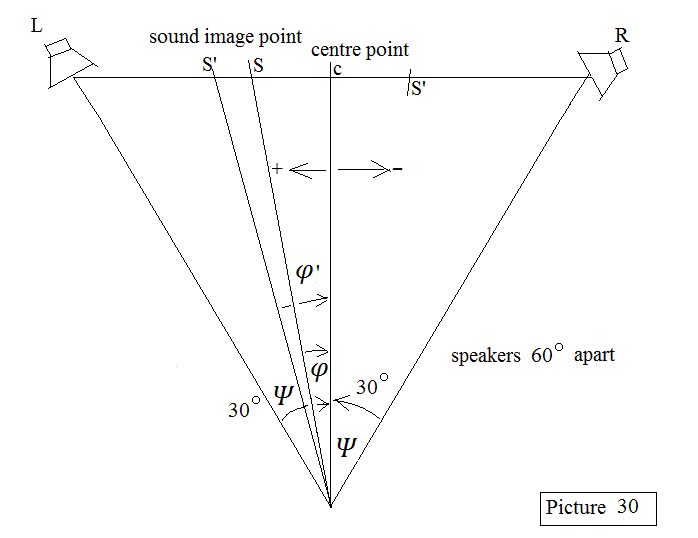 Think about an extreme case, L speaker normal sound and R speaker no sound, (sound level = 0) of cause the sound image will be at L speaker or vice versa. This means the sound image never goes outside the stage line or it will be limited in between two speakers. R has a negative value the signal line swings outside the speaker direction. Two channel being added partial inverted phase signal from each other will expand the sound stage. This is the trade secret for audiophile CD music sound image outside the speakers. 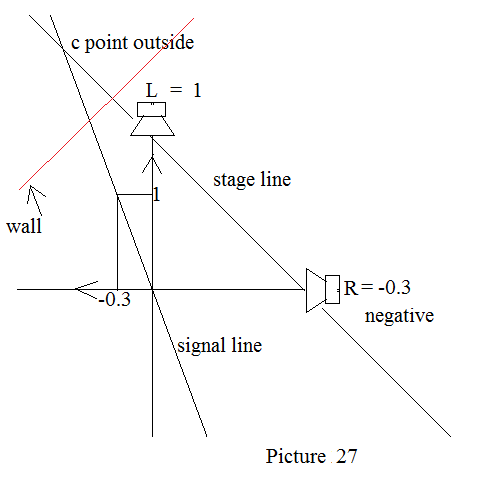 If there is a wall ( red line in picture 27), the sound image will be beyond the wall and this is out of common sense coverage as the special effect. 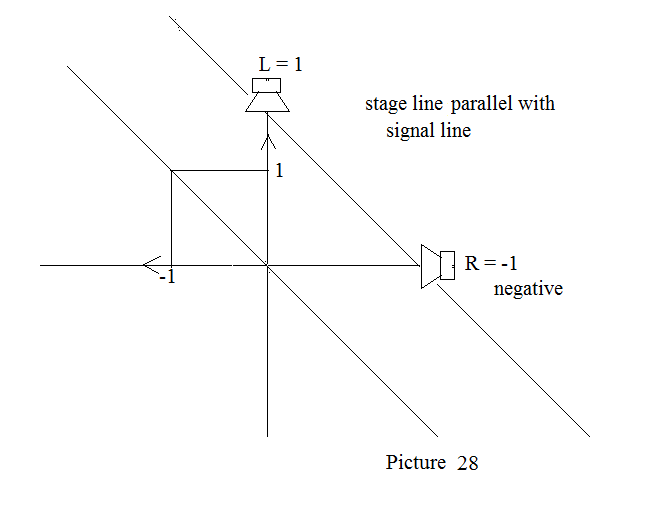 The signal line will be parallel to stage line and never meets each other and no sound image point. The above examples are based on two speakers 90 degrees apart, in many cases the living room size does not allow. How about less than 90 degrees say 60 degrees, known as best sounding speaker angle, is this theory still works fine? 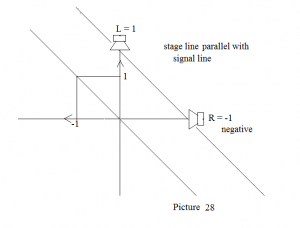 The answer is yes, but the calculation of sound image angle is a bit complicated. 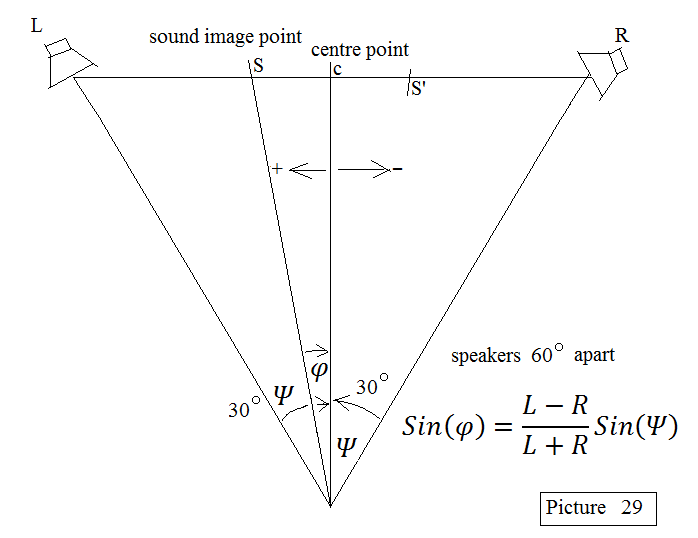 Where Ψ is the half angle of the speakers apart and φ is the sound image angle apart from CENTER line. φ= +9.6° sound image at point S, left-hand side of center point. 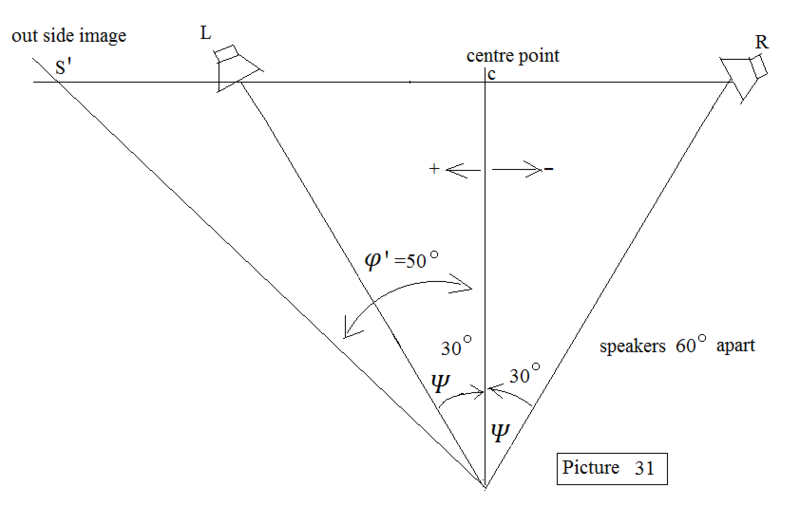 φ =Ψ =30° sound Image point at L speaker or vice versa. Compare the results with that of 90° sound system works.